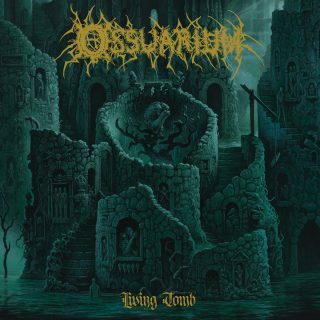 Ossuarium : Living Tomb album download | Has it Leaked? Ossuarium sets up their debut record as a greatest-hits collection of doom-death’s mottled history: after a negligible intro track, opener “Blaze of Bodies” unloads a flaming salvo onto listeners with little warning or lead-up. A corpuscular mid-paced riff switches to a full-on tremolo section set atop pulverizing blasts; Finn-death legends Convulse and Demigod both come to mind through the immense musculature all three share in their sound. Some clean guitar enters the fray for a brief respite, its reverberating and ghostly tone strongly echoing Denver savants Spectral Voice, but before long it is subsumed once more under Ossuarium’s methodical tank-tread assault. One of the gnarliest grooves the genre has seen in a hot minute, a proper love letter to Obituary if ever there was one, takes up the last legs of the track before the clean guitar returns once again to lead us out atop the song’s final punches.